Featuring more than 250 musicians from all over the world, Silay City (Negros Occidental) officially opens the 5th International Rondalla Festival against the backdrop of its storied past and ancestry. Long associated with folk or church music, the rondalla's musical promise and capacity eludes many. However, through the efforts of the National Commission for Culture and Arts (NCCA), the City of Silay, and the Office of Senator Loren Legarda, people from around the world and the Philippines now have the opportunity to witness and experience what plucked string music can offer. The 5th International Rondalla Festival, entitled "Strings of Unity" or Cuerdas sang Paghiliusa celebrates the shared history and ancestry of plucked string music with many other nations of the world. 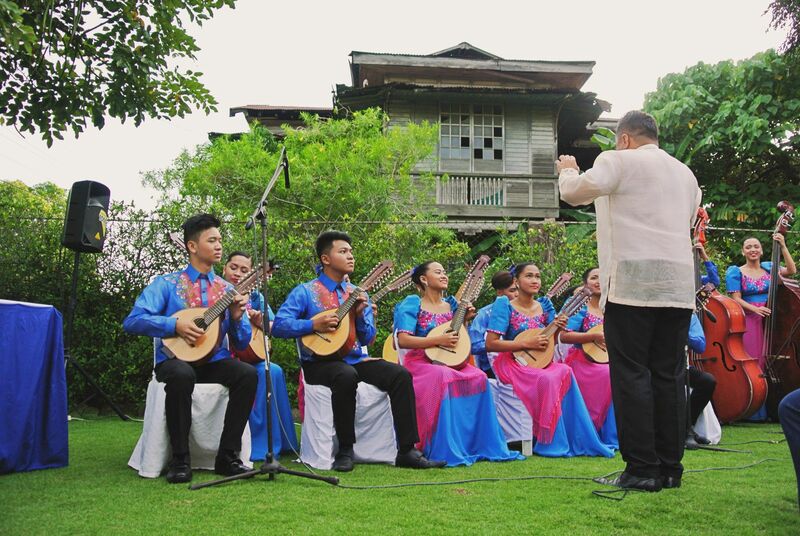 Featuring 10 international ensembles and 11 Filipino rondalla groups, the festival held its opening concert last Sunday, November 4, in the beautiful city of Silay (Negros Occidental). Silay is home to more than 30 historical sites and has been hailed the Paris of Negros, due to its cultural and historical prominence during the 17th century. Once the centre of cultural trade, the quaint and idyllic city boasts well-preserved ancestral mansions, picturesque landscapes, and heirloom recipes that will make one swoon -- a truly befitting venue for the music festival. To welcome delegates, NCCA Chairman and National Artist for Literature Virgilio Almario read a heart-warming message from Senator Loren Legarda who mused upon the importance of the festival and how it celebrates shared culture and the love for art. Festival Director and National Artist for Music Dr. Ramon Santos adressed the enthusiastic crowd and talked about the growth and purpose of the festival -- to unite people from different backgrounds through music. The opening concert featured beautiful performances from Israel (Barrocade-Naya Ensemble), Uganda (Hope to Hop Africa), Taiwan (Taiwan Bamboo Orchestra and Taipei Guzheng Ensemble), and the Philippines (Kabataan Silay Rondalla Ensemble). The performances were touching and diverse, and definitely left me wanting for more! Israel's performance was an effortless display of technical prowess and musicality. While the Taiwan ensemble seemingly brought us back in time with their performances that featured bamboo instruments -- one could even close their eyes and imagine the panning landscape of Tawain's beautiful parks as the group played. Uganda's Hope to Hop was a crowd favourite with their stylistic chanting and unique melody -- the three performers sang in unison and smiles on their faces. Not to be outdone however was the Philippines's KSR, who performed renditions of "Ating Musika" and The Beatles' "And I Love Her". Ending the evening with a bang, the Silay City locals encouraged everyone to dance to traditional parade music, but not before a heartfelt oathtaking amongst the delegates was held. More perfomances await as the festival continues until November 11. With two concerts per day, the people of Silay and music lovers will get to witness the diversity of plucked string music. Furthermore, the festival will hold several outreach concerts around the different parts of the Negros province to bring music to schools and various local neighbourhoods. Musicians have flown in from France, India, Iran, Israel, South Korea, Thailand, Uganda, Vietnam, Taiwan and Portugal to celebrate cultural tradition and a shared love for music. The 5th International Rondalla Festival runs from November 4 to 11 in Silay City, Negros Occidental. For more information, you may visit stringsofunity.org or follow them on Facebook.